← A Blog A Day Will Keep The Boredom Away! This is the Chinese New Year, Year of the Monkey. You all know how they are always playing, swinging from trees non stop, up to no good, up to tons of fun. Well that explains what my life has been lately. BUSY BUSY BUSY FAST FAST FAST FUN FUN FUN!!! NONSTOP! I have had a Brother Innovis 2500D sewing/embroidery combination machine for several years maybe eight plus! I finally decided to take some classes. Until then I just used it for a very expensive sewing machine. Now it is getting an embroidery work out. Here are a couple of projects that I have been trying out lately! I hope you enjoy. More to come. This first shirt was my very first project . 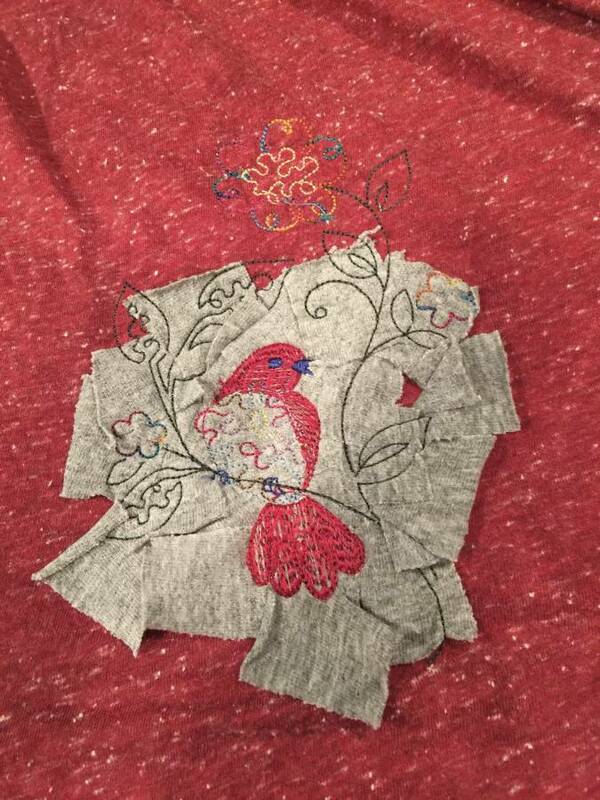 I did not select the proper thread color to accent the bird but I think you all can get an idea as to what it is suppose to be. A bird on a nest. I liked the way we took a scrap t-shirt and cut it up to make the next. Even regular cotton fabric would work. I really like this shirt. Two colors of fabric with several different colors of thread. The back side was as equally beautiful minus the fabric. In the future I am going to put a cross on a white shirt just using thread. 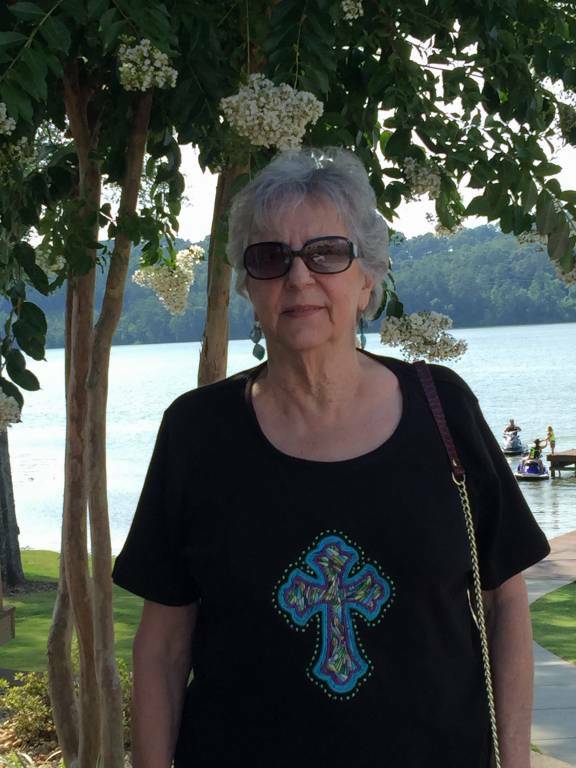 This is my beautiful spokesmodel Deara (my aunt) I think the shirt looks marvelous on her! 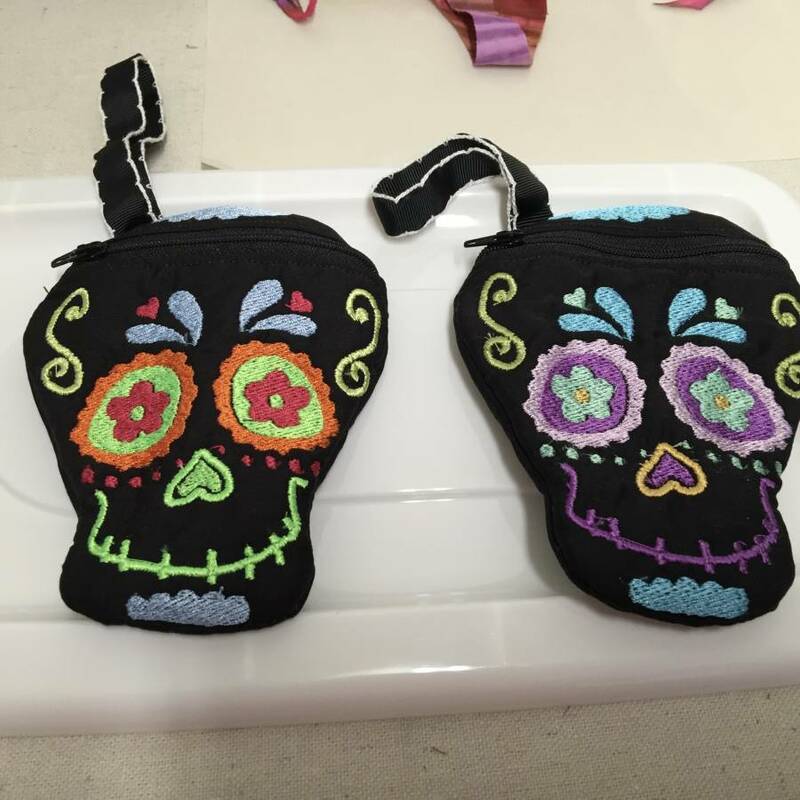 This past 4th of July instead of cooking out and partying a friend of mine, you all know as Agent Wade..who is my quilting buddy and I made Sugar Skull purses. Mine is on the left with the orange eyes, hers is on the right with the purple eyes. I am showing both to show you how beautiful they are in all colors. The worst part of these is the turning the purse out and changing of the tread. We must have changed the tread a million times. I see a thread at the top I need to clip! We also used white fabric to see how we were going to like these. I like it on white. Next time I will use a tonal white not a solid white and a different colored zipper. One to match the eyes or some other part of the face! I messed up the top part. I just knew it was going to have a crew cut. I am proud of myself. I figured out how to back up the machine start over on the top part and it worked! YAY ME! I figured the worst mine would look like it had a bad haircut! Linda said “been in a fight have a scar!” It all worked out. This entry was posted in 2016, 2016 A Post A Day Will Keep The Troubles Away, Machine Embroidery, Main. Bookmark the permalink. One Response to I Post A Day Will Keep The Boredom Away! 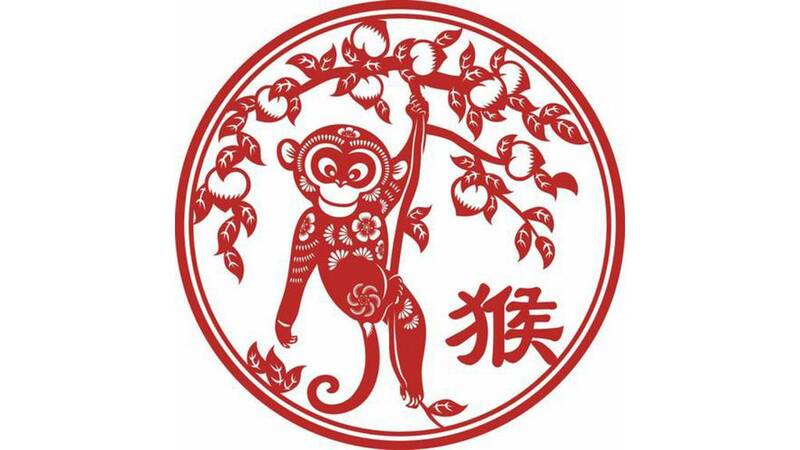 Year Of The Monkey! Finally Getting Projects Done. 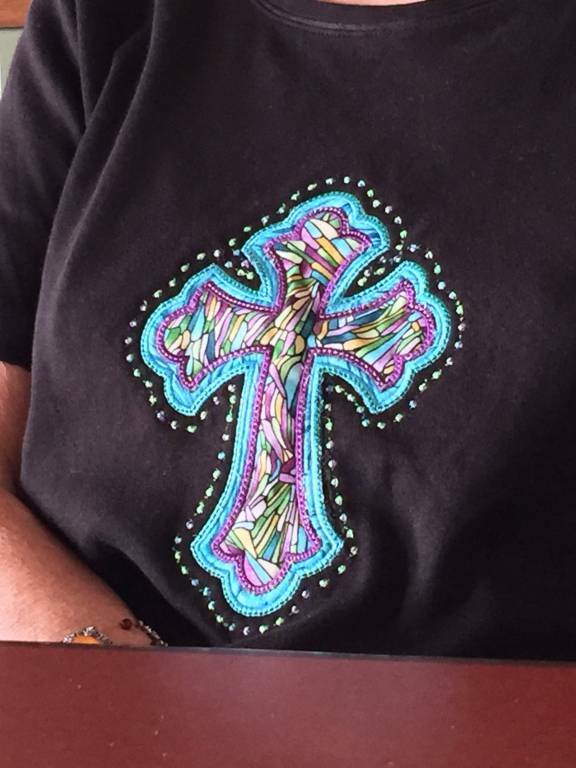 Love that cross shirt. Cute model, too. 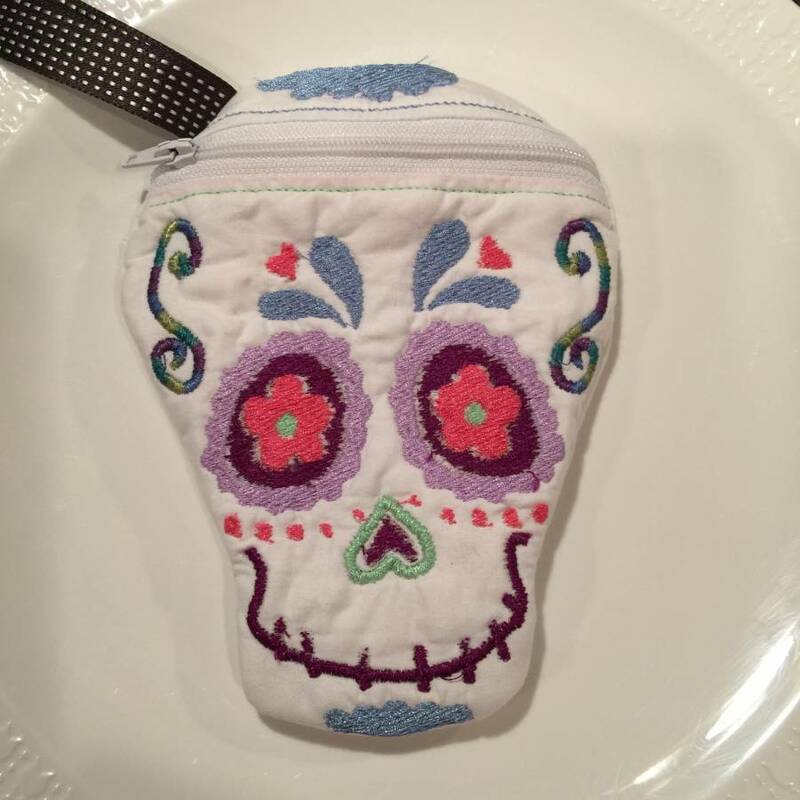 Cheryl Parker´s last blog post ..Keeping Busy!